TOKAJI.com .::. 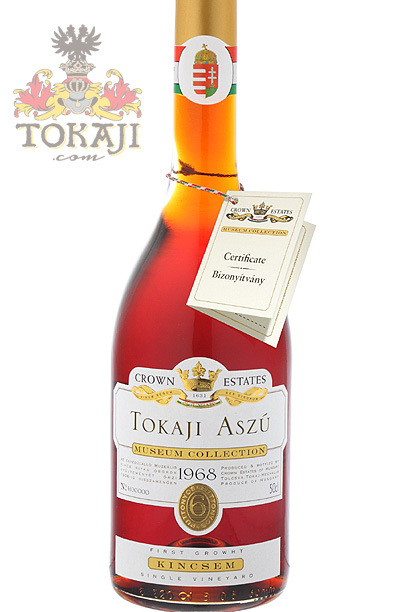 Buy Historic Tokaji : 1968 Tokaji Aszú 6 put. "Kincsem"
You are here: Home BUY TOKAJI Buy Historic Tokaji 1968 Tokaji Aszú 6 put. "Kincsem"
A museal growthselected Aszú from the First Class „Kincsem“ vineyard. Released within the Museum Collection in 2012, so it is recently rebottled, tasted and certified by the cellarmaster of Crown Estates of Hungary. Dried fruit from pear through apricot and orange to raisins, cantaloupe, leaf litter, tobacco, fine smoke – all this doused in chestnut honey. Vanilla, spices, mild citrus fruit present themselves together with tastes of chocolate and honey caramel in the sip. Its acids are vibrant, making the sip graceful, almost ready to take to flight. Everything in this wine is in the right place, at the right time and in the right way: perfection is near. "Dark Brown. Powerful aromas of candied orange peel, malt, honey, vanilla and ripe peach. A sweet wine to be taken serious, with mild notes of chamomile and dried tropical fruits." The Kincsem vineyard is situated 1.5 km East of Tolcsva, bordered by the Kopaszka, Dobra and Zsadányi plots. Elevation above sea level is 150-250 metres, and it slopes S-SW by 5-15 %. The terroir is brown forest soil with clay pockets. The base rock is rhyolitic tuff. Water balance is fairly good as a consequence of high clay content, making it an excellent soil for growing vine even in the years of drought. The open hills, with the old Waldbott residence on their top, have perfect exposure to the sun and are close to the Bodrog river flood plain to benefit from the misty mornings that create the best conditions for botrytis. Wines from Kincsem are known for their rich fruit and firm acidity. While in older publications, it was just implicit alluded in mention of Zsadány-hegy, Kincsem (which in Hungarian means "My Treasure") gained its reputation after the phylloxera. Kossuth said in 1903, that Kincsem was "amongst the foremost vineyards" of Hegyalja, and related that after phylloxera it had been strikingly replanted by the owner Baron Friedrich Waldbott, with the effect that a banker offered a huge sum for the vineyard. Kincsem is named after the invincible Hungarian racehorse, that still today helds the unbeaten record of having won 55 races for 55 starts in the 1870's and 1880's.